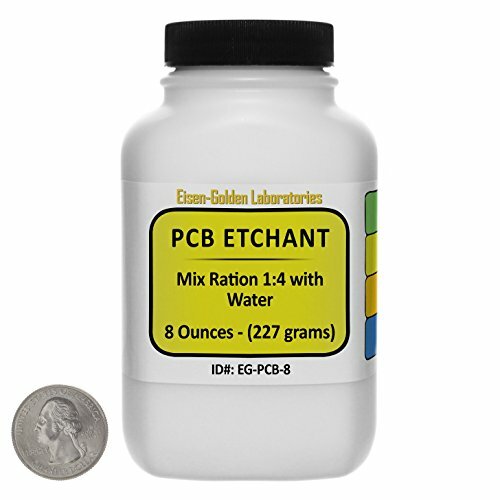 You are buying 8 Ounces (by weight) of Printed Circuit Board Etchant. The item ships in an 8 Fluid Ounce (by volume) Polypropylene bottle. The active ingredient in our Etchant is Ammonium Persulfate ((NH4)2S2O8). SUGGESTED USE Mix with water to make your own etching solution. 4 Ounces makes 16 Fluid Ounces (448 mL) of Solution. 16 Fluid Ounces of Solution etches 280 square inches of circuit board. This etchant remains transparent as it dissolves the copper from the board so you can monitor the etching process (unlike Ferric Chloride solution, which turns black). No heating or agitation required. Etching time is 5-15 minutes at room temperature. Spent solution can be neutralized with Baking Soda (Sodium Bicarbonate). The spent solution contains Copper Sulfate. SHIPS FAST FROM CALIFORNIA, USA! 2-4 day transit time throughout the country. We ship three times a day; so your item is guaranteed to go out the very same day you place your order. Our bottles are made of sturdy polypropylene. The square, "space-saver" shape ensures that the bottles fit snugly on a shelf. The wide mouth makes for easy dispensing and stackability. To ensure a spill-free journey, we shrink-wrap the screw tops and seal the bottles in plastic.